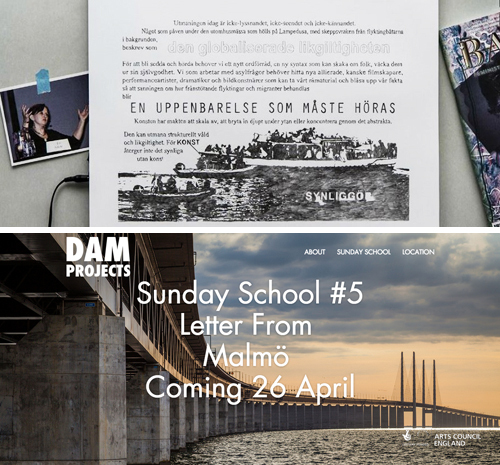 Welcome to Letter From Malmö, a one-day exhibition organised by DAM PROJECTS. Works by Maj Hasager, Hans Carlson, EvaMarie Lindahl and Lisa Nyberg will be shown. The video for En uppenbarelse som måste höras will be on display together with fanzines and ephemera from the Malmö area. A documentary shot in Malmö – featuring interviews with artists Ingela Ihrman, Max Solca, cultural producer Oyuki Matsumoto, Lisa Nyberg, Rundgång Rekords’ owner Dennis Lood and more, will be available to watch online from April 26. Don’t miss the conversation with Lisa Nyberg, on site, at 16.00.